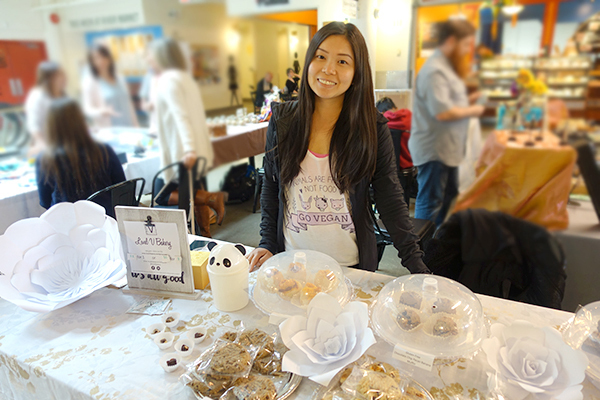 Level V Bakery is an online plant-based business in Richmond, BC, run by Monica Tang. We talked to Monica about the challenges and rewards of starting a business… and her amazing vegan cakes! Why did you decide to start Level V Bakery? I always had dabbled in baking, but it wasn’t until January of 2017 that I took it more seriously, after my vegan BFF Maria ordered my very first cake. Baking gives me a creative outlet since I need to be creative in order to replace eggs and dairy with vegan substitutes. I wanted to impress people and show that vegan desserts can be delicious and look amazing too. What has been the reaction from consumers so far? The usual response I receive from vegans and non-vegans is that they cannot believe that my cakes tastes better than non-vegan cakes. They are also usually impressed at how moist my cakes are and yet also not too sweet. 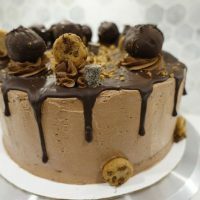 My most requested cakes are the tiramisu, cookie dough, and chocolate peanut butter banana. The tiramisu was one my first cake flavours I developed. It’s an interpretation of a traditional tiramisu because one of my favourite non-vegan cakes I used to eat was a tiramisu from a Chinese bakery in Kerrisdale. It has three layers of vanilla sponge cake soaked in coffee, chocolate aquafaba mousse and is topped with a layer of coconut whipped cream. The cookie dough cake gives you the best of both worlds of chocolate and vanilla. 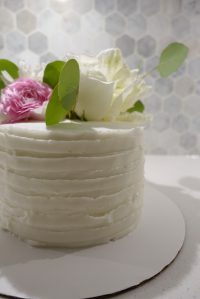 This cake has five layers of vanilla sponge cake speckled with chocolate shavings – and in between each layer is a light chocolate frosting. It’s decorated with a chocolate ganache drip and cookie dough truffles. The chocolate PB banana cake was first created for my boyfriend (now husband) because it encompasses all of his favourite flavours. This cake has fresh bananas and peanut butter frosting in between five layers of chocolate cake. It’s also decorated with a chocolate ganache drip and addictive peanut butter pretzel chocolate gems. Although these are my most popular flavours, I am always trying out new flavours and coming up with new creations. What are the biggest challenges in making vegan desserts? The largest hurdle I face making vegan desserts is finding the time and energy to try new recipes and to replicate items that need eggs. Things I’d like to achieve one day is to develop a vegan cream puff and vegan bubble waffles! My main customers are vegans who share their cakes with their fellow vegan friends and omnivorous buddies. It’s great to know that my cakes can be enjoyed by everyone and doesn’t make one or the other feel excluded from the occasion they are celebrating. Do you plan to expand the business? I may have the opportunity to provide vegan baked goods to a local organic grocer in the near future! What is the hardest part about opening a vegan business? I think the hardest part is to get started, even though there is a growing trend of vegan companies out there. I don’t really feel like it is about competing against each other, but to support other businesses, welcome new ideas, and to work together to achieve the goal of a vegan mecca. The best part of making vegan desserts is to share them with other people and receive their reaction! I love it when people tell me what they think, how they like it, and what I could improve on. Do you think demand is growing for plant-based foods? I do believe there is a growing demand. As more people become exposed to words like “plant based” and “vegan” and with an abundance of vegan options now available, people are starting to become more aware that the choices they make have a great impact on their health and the environment. Where do you see Level V Bakery in five years? I haven’t even gave that a thought. Hopefully making desserts on a larger scale and providing to local grocers, cafes, and restaurants. But my dream would be to open my own bakery and have my own bricks and mortar store!